Friends of Falun Gong is a group of citizens concerned about the ongoing persecution of Falun Gong meditators in China. Falun Gong is a Buddhist-Daoist spritual practice centered on the principles of truthfulness, compassion, and forbearance. However, since 1999, the Chinese communist regime singled out Falun Gong as a target of elimination, justifying the genocide with its propaganda. Tens of thousands have been wrongfully imprisoned without trial, and unknown numbers have died of torture or forced organ harvesting in China’s jails. 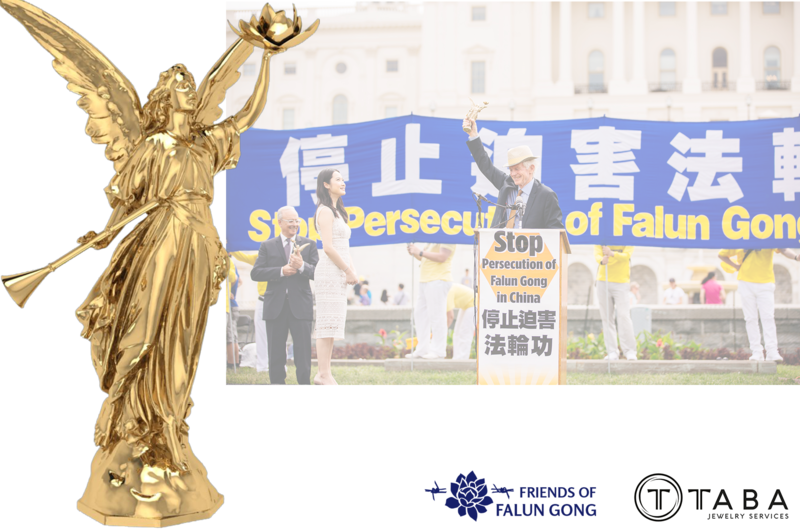 Each year Friends of Falun Gong honors individuals who have exhibited courage in working to curb this brutal persecution. We at Taba support this effort by donating our casting and finishing services. Weighing in at 6lbs and created specially for this occasion, the trophies feature a winged angel carrying in one hand a lotus flower, signifying the power to rise above adversity; and in the other, a trumpet, urging us to spread the truth. We hope that our small contribution to this cause will lessen the incredible suffering of innocent believers in China, and those of us in the free world are encouraged to expose the evildoers’ deeds and bring about justice.